A truck passing stacks of wood in Labai Hilir, Ketapang, West Kalimantan. @Auriga, 2014. August 15, 2018. In recent years, global paper giants Asia Pulp & Paper (APP) and Asia Pacific Resources International Holdings Limited (APRIL) have made heavily publicized commitments to have “zero deforestation” and respect for human rights in their supply chains. Yet official wood utilization reports compiled by the Indonesian government show that in 2017 both companies purchased wood from PT Fajar Surya Swadaya, an East Kalimantan concession-holder, which has cleared nearly 20,000 hectares (ha) of natural forest since 2013. APP also purchased wood from PT Silva Rimba Lestari, another East Kalimantan forestry company which has cleared more than 12,000 ha of natural forest during the same period. 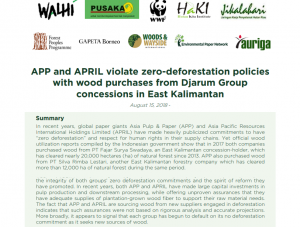 APP and APRIL’s purchases of wood from these companies raise fundamental questions about the integrity of both groups’ zero deforestation commitments and the spirit of reform they have promoted. In recent years, both APP and APRIL have made large capital investments in pulp production and downstream processing, while offering unproven assurances that they have adequate supplies of plantation-grown wood fiber to support their raw material needs. The fact that APP and APRIL are sourcing wood from new suppliers engaged in deforestation indicates that such assurances were not based on rigorous analysis and accurate projections. More broadly, it appears to signal that each group has begun to default on its no deforestation commitment as it seeks new sources of wood.